Throughout my life, I’ve been a lot of things—wife, mother, financial consultant, ninja—but never a jogger. I knew people who jogged and claimed it exhilarated them. I’d read numerous articles that revealed the nastiness jogging does to the body—wearing away every cushion between every joint from the toes to the hips and jostling delicate female organs. I was unclear as to what damage this jostling actually does to the female reproductive system, but didn’t want to experience it. Thus, without ever trying, I hated jogging. This notion was tested three years ago when my friend Kathleen suggested we train for a sprint triathlon. I agreed before I knew exactly what that was—a half-mile swim, 21.7-mile bike ride, and 5K run. I tried to renege, but Kathleen wouldn’t let me. Six months before the race, I embarked on a rigorous training schedule that began, obviously, with my hair. I got it cut man-comb short and highlighted. If I couldn’t get out of the race, I could at least give myself a chance to look good—without benefit of hair products—in the after photos. The hair was the easiest part of training. A far more difficult challenge was keeping up my whining to Kathleen—“We’re too old for this.” “We don’t have enough time to properly train.” “My uterus hurts.” “We’re going to die.” She’d smile and say “We are going to do this,” before she swam, biked or ran away. For my first running session, I set the thingy on the treadmill to 3.0 and walked at a comfortable pace for a few minutes. I gradually increased to 4.0 which forced me into a baby jog. I struggled for air and battled against vomiting as I pushed this pace for a full minute. I went back to 3.0 for a couple of minutes and up to 4.0 for another minute. Coughing and sweating, I shut off the treadmill and limped to my car. In between two biking and two swimming sessions a week, I was forced to jog. Each time, I cursed the treadmill and the damned triathlon. Then something strange happened—I was able to add 30 seconds to the baby-jog time before the barfing sensation kicked in. It got weirder. Within a few weeks, I found myself yearning to jog. At the end of week three, I pushed myself to run half a mile. It took nine minutes. At that rate, I could finish a 5K in just under an hour! Whenever my heart felt it would burst, I’d start to cough. (I once read that you should cough whenever you feel you’re having a heart attack.) I released sporadic grunts and groans and whispered, “You can do it. You can do it.” I ignored the eye-rolling glances of those around me. A month later, I was able to increase my speed to 5.0 for an entire mile. I jogged outside once a week. I learned the virtues of stretching, ice packs and ibuprofen. While I hoped for an injury that would take me out of the competition, the only mishap I encountered was waking one morning with a rather large, alarming blood splat in the outside corner of my right eye. The doctor explained that it was a harmless hooty and it’d go away. I asked her to write me a prescription against the triathlon. She declined. The six months of training paid off. I finally learned how to spell triathlon and finished the race in about three hours. Over the following two years, I continued to run, but often skipped a planned session in favor of inertia. 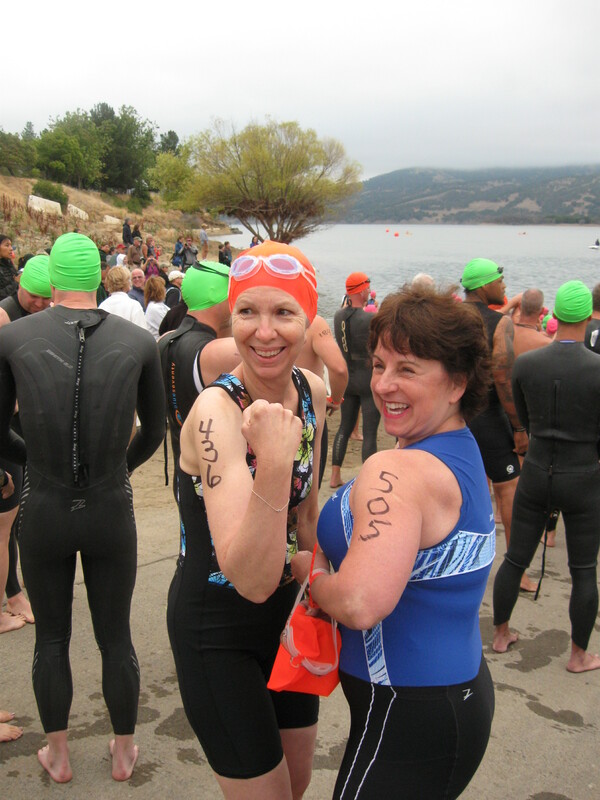 Then my friend Jackie challenged me to do the March 2014 Whale Run (merely by telling me she was going to do it). I wish I could say the second round of training was easier than the first. But every aspect of running is a chore—from thinking about it, to getting dressed, to leaving the house and actually doing it. It’s only after, when I’m so flaming exhausted, euphoria kicks in and convinces me that it’s a good thing. The Whale Run began at 8:00 am on Saturday, March 15th. I rarely venture outside at that hour, let alone on a Saturday. All day Friday I twitched with anxiety over making a respectable showing so early in the morning. I was able to jog most of the race, slowing to a walk only a couple of times. When I crossed the railroad tracks near the finish line, I noticed the clock showed 34:something minutes. My best training time had been 36 minutes. If I kicked it, I could possibly make it in 35. I crossed the finish line, my friends cheering me on, at 34:26! The moments of celebration that followed—hugging my fellow competitors and taking my cheerleaders to breakfast—made all the miles of agonizing training worthwhile. I guess I can now say that whatever else I am—owner of Lucy-puppy, blogger, whiner—I’m also a jogger. 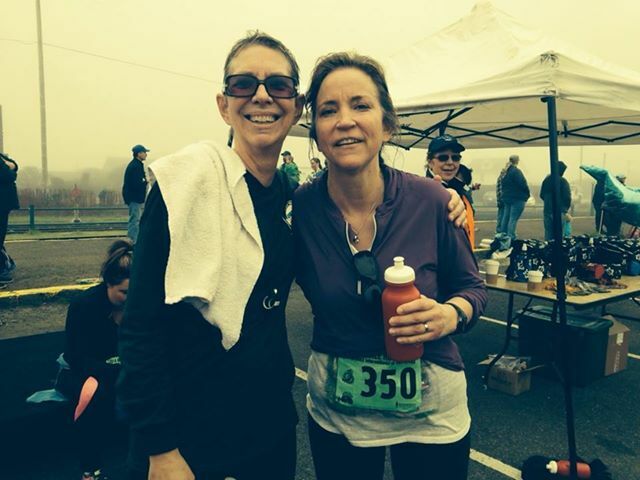 This entry was posted in California, Fort Bragg California, Humor, Mendocino County, Northern California, Self-Help, Small Town and tagged Fort Bragg Whale Run, Jogging, Soroptimist International, South Ukiah Rotary Triathlon by Kate. Bookmark the permalink. Have I told you how much I look forward to Fridays so I can read your latest musings? Oh Laurie, you’re so sweet. While I agree with all your whining about the preparation for jogging, both mental and physical, you must say it has kept you fabulously thin! You have to call yourself a “runner” now! Thank you Angela, but looking at your finish time I believe YOU can call yourself a runner. I’m just a jogger. But, hey, three years ago I was a slug. Jogger sounds better than that. Dear Kate, I hope I find the chutzpah to be like you someday. In the meantime, I will keep buying running shorts and putting them in my dresser! I approve of your behavior. Some day you’ll pull those running shorts out of your dresser, notice they are 20 years out of style, buy new shorts and hit the trail. Totally good writing. You did good!